"I feel now in some ways my life has been deprived now that I've listened to yours." 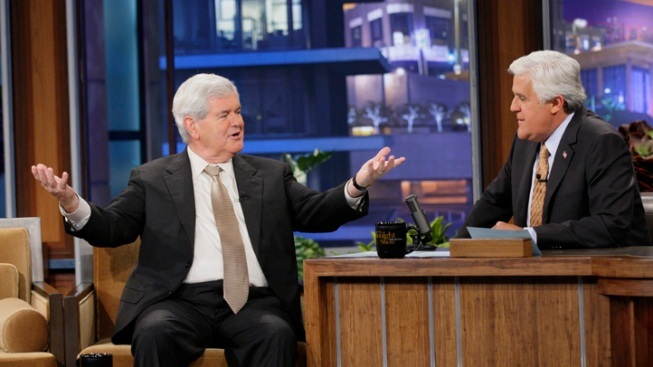 Newt Gingrich dropped by the "Tonight Show," where he mingled with "Jersey Shore's" Snooki. The former Republican presidential candidate dropped by the "Tonight Show" on Wednesday, where he discussed politics and the upcoming elections, and had an unexpected meeting of the minds with "Jersey Shore's" own Nicole "Snooki" Polizzi. The 69-year-old politician and the 24-year-old reality television star established an easy rapport, discussing their best-selling books and the possibility of having Gingrich guest star in a future episode of "Snooki & JWoWW." Gingrich congratulated Snooki on making it on the New York Times Best Seller list with her 2011 book "A Shore Thing." "Thank you," Snooki replied. "I am trying to be like you." The former Speaker of the U.S. House of Representatives is a best-selling author himself, having written 19 books, 11 of them New York Times best sellers. Although Gingrich admitted he has never seen an episode of "Jersey Shore," Snooki wasted no time regalling the former House Speaker with tidbits about the Shore. "I feel now in some ways my life has been deprived now that I've listened to yours," Gingrich quipped. After discussing Snooki's reality television show spin-off, "Snooki & JWoWW," the late night show host brought up the possibility of having Gingrich guest star on the show. "That would be awesome! You could like drink Ron-Ron juice and stuff," the pint-sized reality television star said, referring to a homemade concotion of watermelon, cherries, cranberry juice, vodka and ice, a drink popularized by "Jersey Shore" castmate Ronnie Ortiz-Magro. When asked about the last time he "got wasted," Gingrich deadpanned "Just thinking about coming on this show."